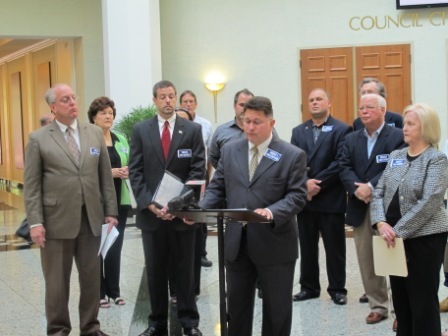 JACKSONVILLE, FL—Today FFPC President and General Counsel John Stemberger stood with former Jacksonville City Council President Ginger Soud, legal expert Roger Gannam, Attorney Joey Vaughn and other leaders to make news announcements and highlight major concerns with the City’s proposed nondiscrimination ordinance, 2012-296. Local Jacksonville attorney Joey Vaughn started the conference by announcing that in the past week the number of citizens in opposition to this bill has more than doubled the number of those for the new gay rights bill. Some Jacksonville councilmen have reportedly received well over 2,000 calls and emails in opposition to ordinance 296. John Stemberger said “A vote for this sexual orientation ordinance is a vote against Florida law defining marriage as the union of one man and one woman.” Further, “If this body enacts this bill it will further undermine the long-term stability of Florida’s Marriage Protection Amendment,” he said, referring to the state constitutional amendment adopted in 2008 by 62% of Florida’s voters, including 69% of Jacksonville voters. Such precedents are being used as arguments against similar marriage protections in California, Iowa, New Hampshire, Washington, DC, Vermont and elsewhere. Soud spoke about other cities’ similar ordinances being overturned in Nebraska, Tennessee, Montana, New York and other locations. 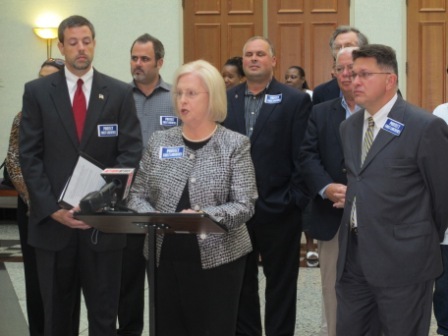 “Let me be clear: Jacksonville is not alone in rejection of this legislation,” she stressed. The ordinance would be bad for businesses which would be forced to expend funds on gender-neutral facilities and questionable legal challenges. It would also suppress free speech, especially in the workplace; and freedom of religion, particularly at hospitals and health care facilities. “Ordinance 296 is probably the most radical and open-ended ordinance ever to be thrust upon the City of Jacksonville by organized outside forces,” said attorney Roger K. Gannam. “It allows government intrusion into private business decisions, will trample on people’s right to free speech and freedom of religion, and will assault the privacy and modesty of individuals and families.” He expounded on his concerns in a formal memorandum to City Commissioners. 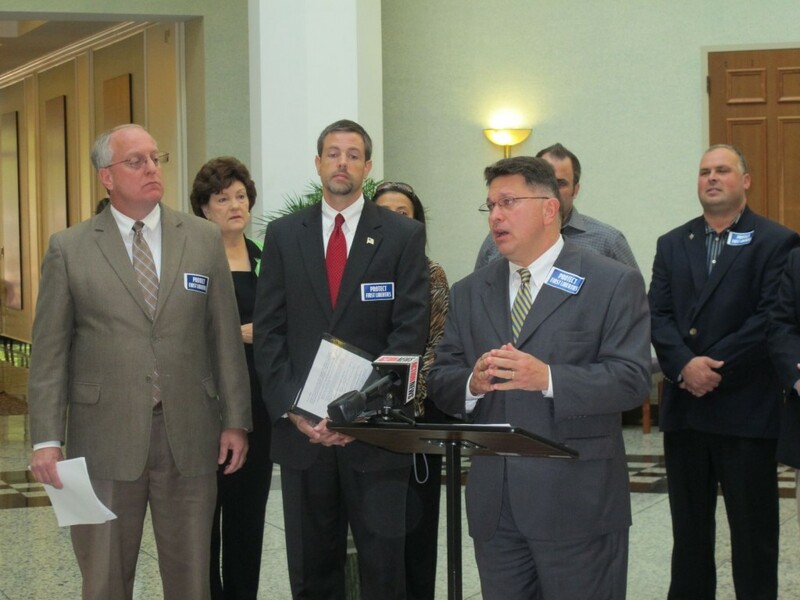 Local Jacksonville attorney Joey Vaughn refuted the arguments of those supporting the bill who claim people were not moving to Jacksonville because of alleged widespread discrimination against gays and lesbians. Vaughn cited a May 18, 2012 article which surveyed college graduates looking for jobs and found Jacksonville the number three city in the country for relocation, jobs and overall “happiest cities in the country”. Further, the very studies cited and commissioned by gay rights activists show that a supermajority (85% of those surveyed) felt any prejudice against gays and lesbians was either “non-existent” or “low”. Ginger Soud was President of the Jacksonville City Council from 1999 to 2000. John Stemberger is an attorney in Orlando and the President of the Florida Family Policy Council. Roger K. Gannam is a partner with Lindell & Farson, P.A.